Family Photo Sessions at the McNay — perfect to use for holiday cards, gifts, and more! Bring the whole family, including all four legged friends! *Sessions must be booked in advance. 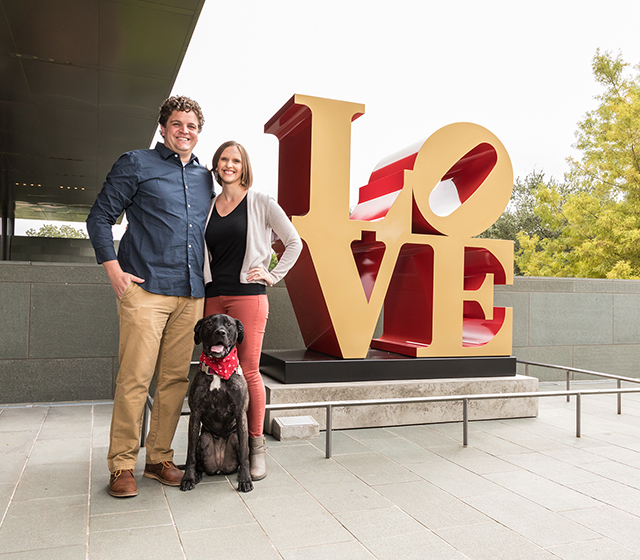 For groups of eight or less (including pets), each session includes 20 minutes with McNay staff photographer by Robert Indiana's famous LOVE Sculpture. Following the session, you will receive three fully edited, high resolution digital images chosen by the photographer. These will be ready for you to use for family portraits, holiday cards, and more! Are you interested in another date or location for your photo session? Try one of these! Cancellation/Rescheduling Policy: Cancelling or rescheduling a session is not permitted. If a session is cancelled, no refund will be issued. If you arrive late or miss the session time, the photographer will determine if the session will take place. If the McNay cancels or reschedules outdoor sessions due to weather, you will receive notification and the opportunity to reschedule or receive a refund. Refund Policy: All general admission, special admission, program fees, event tickets, donations, and memberships are final and non-refundable. Robert Indiana, LOVE, 1966, cast 2002. Painted aluminum. Collection of the McNay Art Museum, Museum purchase with funds from the Russell Hill Rogers Fund for the Arts.